I'm definitely one of those people that feels better about her entire life when her house is clean. Silly, but it makes me feel good when things are neat. However, since having Hayden over a year ago, Nick and I struggled to get into an easy and consistent cleaning pattern. In our pre-baby days we would usually do a marathon cleaning session on the weekend for a few hours and then not worry about it during the week. Things would get messy and we'd clean again the next weekend. Now, I usually don't have 3 hours at a time to devote to cleaning and with an active toddler and both of us home all day, our house was getting messy in about 2 hours. 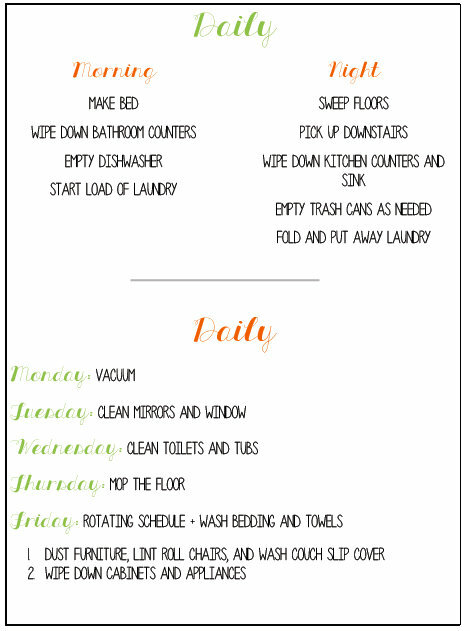 I've heard of a lot of people that said they just cleaned on a daily basis, but it wasn't until I saw a schedule that it made it seem like a manageable way to keep the house clean. I found this cleaning schedule from Jenny @ Little Green Notebook. Nick and I followed it for about a month and then I came up with my own version to fit our cleaning needs a little better. The thing about having a schedule is that my cleaning is broken down into little 15-20 minute chunks, which is so much better for me now. In the mornings I make the bed as soon as Nick gets up and after we're both ready for the day, I wipe down the bathroom sink. It's easy to unload the dishwasher when Hayden is eating his breakfast. I do a lot of picking up throughout the day; when Hayden finishes one activity and moves on to the next, I pick up all the toys instead of leaving them on the ground. This way, there's not a huge mess by the end of the day. Having one daily chore is great because I can do it while he's napping, when I need a break from work, or right after he goes down for the night. At night, Nick has been the one who does the final bedtime routine most nights, now that I'm no longer nursing. This gives me 20 minutes to clean while he's giving H a bottle and then I'm usually done and ready to hang out by the time Hayden's down. If I have a crazy day and don't get to the chore of the day before H's bedtime, Nick is also good about jumping in and helping. Finally, laundry is usually our downfall. We are good about washing clothes but not so much folding and putting them away. I've found that if I do a load every day instead of saving it all for a "Laundry Day", then everything gets done and put away instead of piling up. My last cleaning tip is to store supplies where you use them. For example, we have 3 bathrooms, so I have a set of bathroom cleaning supplies for upstairs and downstairs. I also stash a tube of cleaning wipes (good for wiping down counters) under each sink, including the kitchen sink. This way I'm not trying to remember where I left the supplies and things are always on hand for a quick clean. We streamlined our cleaning products so rather than having 10 different containers of different products, we use 3 different products the majority of the time (Ms. Meyers Clean Day Spray, Seventh Generation Cleaning Wipes, and Murphy's Oil to clean the floors and wood furniture). I feel like having this schedule and devoting a little time each day to cleaning makes it so much more manageable and has really resulted in keeping out house mostly clean and neat. Plus, by doing all the cleaning tasks during the week, our weekends are free for other things! Hello Dear, are you really visiting this site daily, if so after that you will definitely take fastidious knowledge.